Charlottetown Airport | flypei.com | About PEI! Whether you plan to roam our colourful countryside, stroll along the many miles of beaches, golf at a top-rated course, participate in a kitchen ceilidh, browse through our many craft shops, enjoy our Authentic PEI Experiences, or simply laze in a hammock, our official tourism guide and online information will help you plan the vacation you want! Visit www.gentleisland.com to get your copy. No one knows Prince Edward Island better than the people who live and explore it every day. Learn about beaches the locals use, the best spot for kayaking, find out where Islanders buy their fresh seafood and the best attraction to entertain the kids all day. 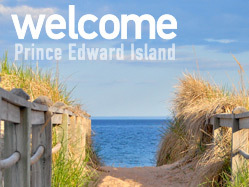 Welcomepei.com has Prince Edward Island travel information on accommodations, festivals, dining, attractions and shops and a local's blog dedicated to sharing all the BEST things to see and do in PEI from the insider's perspective. 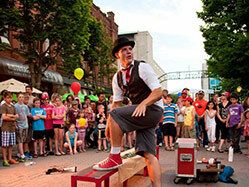 PEI's capital city Charlottetown is a bustling city that is sure to leave a lasting impression. Streets are lined with quaint buildings, first class restaurants and live entertainment. From boat tours, a mile long boardwalk along the ocean, harness racing, local markets, to world class theater you will be amazed at the amount of things to see and do in this walkable city. With rich history at every turn, whether you’re looking to relax on the scenic waterfront, or explore the vibrant streets, Charlottetown has no shortage of activities to keep you entertained. 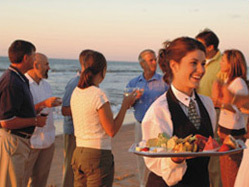 Culinary, culture, golf and unique on-the-water attractions all come together to ensure your Best Event Ever! PEI's size means your delegates feel a special welcome and the whole Island is at your fingertips. Whether your event has 1,500 delegates hosted on-the-water at the new 50,000 sq/ft. Prince Edward Island Convention Centre, or an intimate group of 10-15 at any of the smaller resorts and cottages dotted right across the Island, the M&C PEI team will help you program an unforgettable taste of the Island, one that will ensure great delegate participation. In fact, many of our delegate guests "Come Early, Stay Late" and turn work into a playful yet restful vacation. Prince Edward Island has over 2,000 hotel rooms and over 200,000 sq/ft. of meeting and exhibit space. We are Canada's premiere coastal meeting destination. The fresh sea air, food and warm Island hospitality engage the senses. Hungry for more? For information visit Meet In PEI. 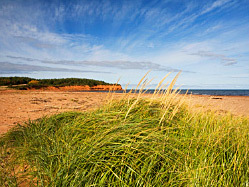 HOME FLIGHTS TRAVELLER INFO TRANSPORTATION CAA in the COMMUNITY NEWS ABOUT PEI! RFP & TENDERS JUST GO!